Slot developer Play’n Go is renowned for its quirky take on common slot themes with the humorous Cops ‘n’ Robbers slot giving a new angle to the copper slot genre and the recently released Energoonz slot offering a different take on intergalactic-themed slots. 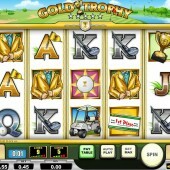 Gold Trophy therefore unsurprisingly offers a nice change to the usual sports-themed slots out there. It has a golf theme and when playing this slot it has a lovely relaxing feel to it that actually makes you feel like you’re out on the course. It is a 5 reel, 9 pay-line slot that has symbols on the reels including golf balls, golf carts, prize checks and even the regular symbols are decorated with golf clubs, golf balls and flags. Look Out for the Gold Trophy Wild! The Wild is represented by the gold trophy symbol and substitutes for all other symbols except for the Scatter to complete winning combinations and help you win some prizes. The Scatter in this slot comes in the form of the prize check symbol. This symbol is what you want to look out for in order to trigger the Pick a Check Bonus. If you hit three or more prize check symbols across the reels then you will trigger the bonus feature where you will need to pick one of the prize checks displayed on the screen to reveal a number of up to 25 free spins. During the free spins any winning combinations hit will reward a 3x multiplier and winning combinations that include the gold trophy Wild will pay out a 6x multiplier. 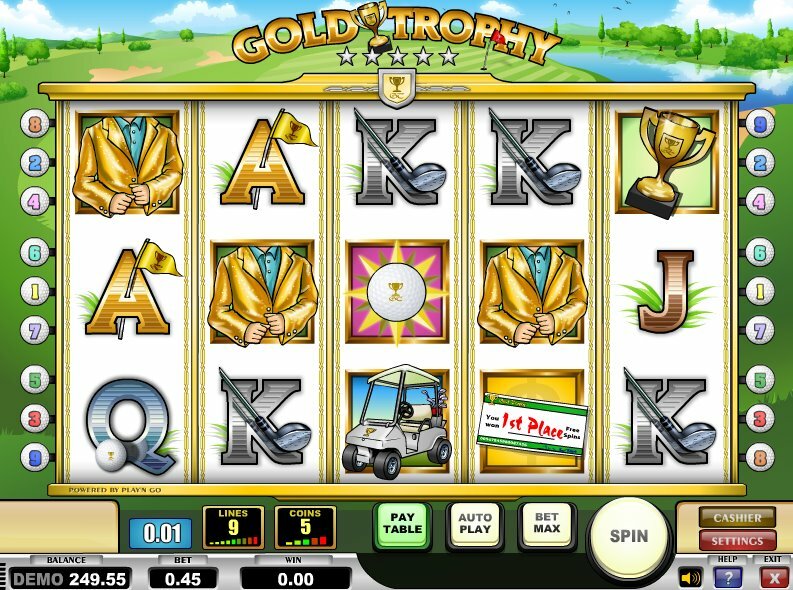 Gold Trophy is not one of the most creative slots out there but it has a chilled out feel to it and it does not restrict the enjoyment to golf fans. If you love free spins and Wilds that actually offer something other than a double pay out then you will want to play this. If you consider that horseracing has Frankie Dettori’s Magic Seven then golf fans will be delighted to know that golf has Gold Trophy.